Hey everyone. I’ve been absent for a few weeks now as I’ve had a lot going on in my personal life that left me no energy to do pretty much anything else. 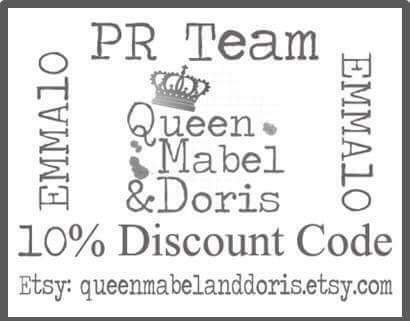 I am however, back and I’ll be kicking off my return with a post showing you my Queen Mabel and Doris PR Kit. I received the kit with 4 beautifully covered inserts, 2 sticker sets and 2 paperclips. The stickers are from The Mix Match Planner and the Christmas ribbon paperclip was from Scarlet Moon Crafts. The inserts were all for Christmas inspired planning and came in A5. Unfortunately my Christmas TN is standard size so I’ve popped them in a generic pink one for now and I’ll purchase an A5 closer to the time. Each booklet was slightly different and ranged from gifts and cards, meal planning and shipping to journaling and decor. I’m really looking forward to getting them all set up and used. There are some more really nice covers available as well in the shop. You can also use my discount for 10% off your purchase. These inserts are fantastic. They should definitely help to get organised for Christmas.